Gigabyte has this week announced a number of new additions to its range of mobile computers one of which is the Gigabyte Padbook. 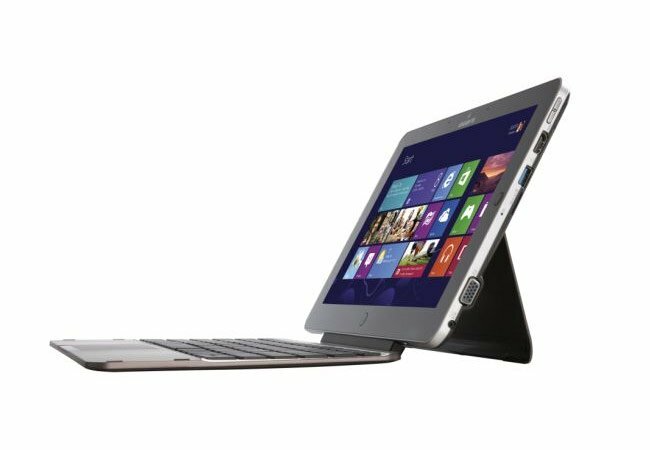 The Gigabyte Padbook is a 11.6 inch tablet featuring a 1920 x 1080 resolution capacitive touchscreen IPS display, and comes complete with a keyboard dock offering a full size QWERTY keyboard for those extra long typing sessions. The 11.6 inch Gigabyte Padbook is powered by a Intel Core processor and features both HDMI and VGA port connections, however specifics about the details of the included hardware in the Gigabyte Padbook have still yet to be revealed by Gigabyte. Another neat feature of the Gigabyte Padbook is the optical button its equipped with that allows you to control the cursor of Microsoft’s latest Windows 8 operating system with your thumb, without the need for any external keyboard or mouse. Unfortunately no information on pricing or worldwide availability has been released as yet by Gigabyte for their new Gigabyte Padbook, but as soon as information comes to light we will keep you updated as always.